"Star Wars Episode II: Attack of the Clones" is an improvement over its predecessor... but that's not saying very much, since the much-maligned "Phantom Menace" wasn't that good to begin with. True, this latest installment of the "Star Wars" franchise boasts more spectacle, has a darker tone, and provides enough 'gee-whiz' moments in "Star Wars" continuity which will certainly make die-hard fans giddy with glee. Unfortunately, writer/director George Lucas struggles once again with the dramatic elements of the story, saddling "Attack of the Clones" with a double whammy of banal dialogue and unintentionally hilarious performances, particularly from the actor who has inherited the pivotal role of Anakin Skywalker, Hayden Christensen. "Star Wars Episode II: Attack of the Clones" picks up about a decade after the close of the previous film. 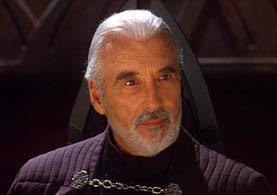 As described in the opening scroll, a separatist movement initiated by the mysterious Count Dooku (Christopher Lee, who played another baddie in "Lord of the Rings: Fellowship of the Ring") is gathering steam in the Republic, which threatens to plunge the galaxy into war. On Coruscant, the arrival of Padme (Natalie Portman), the former queen of Naboo and now full-time senator, is interrupted by an assassination attempt. 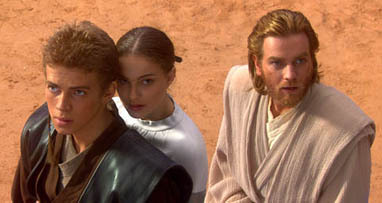 To protect the senator, the Jedi Council assigns Master Jedi Obi-wan Kenobi (Ewan McGregor) and his young apprentice Anakin Skywalker (Christensen) to her security detail. As Obi-wan heads out to the galactic rim to find those responsible for the plot against Padme, Anakin escorts the senator back to the relative safety of Naboo. Obi-wan's investigation leads him to a distant planet where an army of clone soldiers is being readied to do battle for the Republic. And though no one on the Jedi Council remembers ever placing such an order, such an army is a godsend for the beleaguered Republic, which lacks the manpower to fight a full-scale war. In addition, Obi-wan comes face-to-face with man hired to kill Padme, a bounty hunter named Jango Fett (Temuera Morrison of "Speed 2: Cruise Control"). Meanwhile, back on Naboo, Padme and Anakin, who have been reunited after a ten-year absence, begin falling in love. For tried-and-true "Star Wars" fans, there are a number of things that this latest chapter actually does right. Lucas accomplishes quite a bit of setup in "Attack of the Clones", paralleling Anakin's fall from grace with Chancellor Palpatine's (Ian McDiarmid) insidious establishment of what would become the Empire. Thus, a number of elements are introduced, such as the cloned pre-cursors to the Empire's stormtroopers, a first glimpse at what would become an unstoppable fleet of Star Destroyers (made even more chilling to the strains of John William's "Imperial March"), mention of the still-in-concept Death Star, and the origin of fan-favorite villain Boba Fett (seen here as a boy, played by Daniel Logan). A brief stop on Tatooine introduces the people who would become Luke Skywalker's guardians, Owen Lars (Joel Edgerton) and his girlfriend Beru Whiteson (Bonnie Piesse), while Leia's adopted father, Bail Organa (Jimmy Smits, formerly of TV's "NYPD Blue") makes a first appearance. In addition, "Star Wars" fans will be glad to see that the computer-generated comic relief of Jar Jar Binks (voiced by Ahmed Best) has been cut to a minimum, and interestingly enough, becomes an unwitting pawn in Palpatine's scheme to wrestle power away from the Senate. "Attack of the Clones" also provides some of the rousing and eye-popping adventure one would expect from a "Star Wars" movie, particularly in the film's final act, where a "Gladiator"-like arena battle erupts into a full-scale war between the forces of Count Dooku and the Republic's clone troopers. There is no shortage of lightsabre duels either, as a contingent of Jedi masters led by Mace Windu (Samuel L. Jackson, seen recently in "Changing Lanes") face off against a vastly superior number of droids, while an unforgettable (not to mention amusing) fight sequence illustrates why Yoda (voiced by Frank Oz) is considered the greatest Jedi of them all. Unfortunately, these wondrous moments of "Star Wars" magic end up being buried between Lucas' poor attempts to inject drama into this most recent trilogy, particularly in fleshing out Anakin's temptation by the Dark Side and his 'forbidden' romance with Padme. When done properly, detailing the tragic downfall of a protagonist can be compelling and emotionally resonant-- witness the great tragedies of Shakespeare, or in more recent years, the corruption of Michael Corleone in "The Godfather" trilogy. However, instead of offering drama in the vein of Shakespeare, Lucas shovels something more along the lines of "Saved by the Bell". In "The Godfather" trilogy, Michael Corleone, played by Al Pacino, was a smart, honorable, and well-intentioned man who became blindsided by his own ruthless ambitions. In contrast, in "Attack of the Clones", Anakin comes across as a whiny brat who tends to fly off the handle for no apparent reason. Though this is partly due to the weak script, the responsibility falls squarely on the shoulders of Christensen, whose overacting and limited range end up being unintentionally hilarious. During a key scene, where Anakin is confronted by the death of a loved one, the audience broke out in chuckles as Christensen appeared as though he was a deer caught in headlights, unsure of what to do next. A subsequent scene, where Anakin over-emotes "I miss you SOOO MUUUCH!" during a funeral, it was almost tempting to shout back "Your acting is SOOO BAAAD!" It has been said that there is no substitute for good acting, and based on what I saw of Christensen's stilted performance, it certainly was no substitute for good acting. Portman does not fare much better either, as she is forced to utter the same tired and unflattering dialogue that permeates the whole film, using the same abrupt and stilted speaking pattern she used in the first film. In addition, with Anakin alternating between uncontrolled fits of rage and acting like a lecher, it is difficult to understand what the older and conceivably more mature Padme sees in him. Of course, the only reason why these two disparate personalities end up together is for the sake of story continuity, and not because there is actually any chemistry or emotional bond between them. Most of the film's other performances are similarly workman-like. McGregor is good in reprising his role as Obi-wan, though at times, he sounds like a broken record as he instructs Anakin about the ways of the Jedi, or seems to be in a different movie (such as "Lethal Weapon") as he utters unimpressive one-liners in the face of danger. Mind you, he does utter one really good line when he complains that Anakin 'will be the death' of him one day. 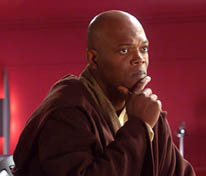 Jackson, whose Mace Windu was only a talking head in the previous film, gets more physical this time around, and true to the actor's style, declares that "This party is over" just before dishing out vengeance with his purple lightsabre. The most interesting villain ends up being Lee, even though his cold-hearted character doesn't even show up until the last act. Among the rest of the cast, Morrison is passable as Jango Fett, McDiarmid looks suitably more sinister this time around, while Smits seems completely out of place as the 'now you see him, now you don't' Bail Organa. "Star Wars Episode II: Attack of the Clones" is not as big of a disappointment as "The Phantom Menace", but it comes pretty close. Though no one actually watches a "Star Wars" movie for the acting or well-crafted dialogue, the absence of these key elements end up being a major distraction in what is supposed to be the ultimate sci-fi moviegoing experience. 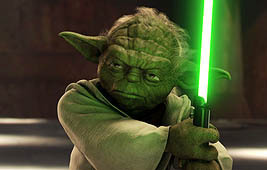 Thus, with nowhere near the emotional pull or edge-of-your-seat excitement of its biggest box office rival, "Spider-Man", "Star Wars" fans will have to settle for the added computer-generated spectacle that "Attack of the Clones" offers, along with the tidbits of "Star Wars" story continuity that are thrown in. Hopefully, Lucas will finally get the formula right in his last shot at bat, Episode III, and based on the setup to date, it looks to be an even more ambitious effort. 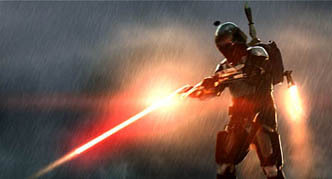 Images courtesy of LucasFilm Ltd. All rights reserved.